Home » Copycat Restaurant Recipes » County Fair Funnel Cakes – you can make funnel cakes just like you buy out. County Fair Funnel Cakes – you can make funnel cakes just like you buy out. We have had many requests for funnel cakes. You can make these at home with a little preparation. They will certainly cost less than the five dollar price tag we often see on these! 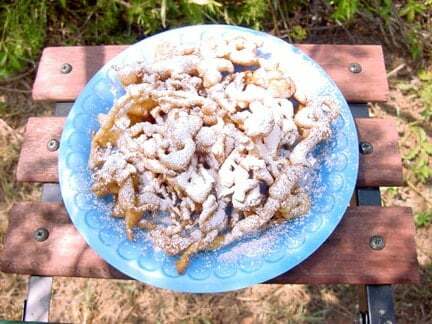 Make County Fair Funnel Cakes just like they do in fairs with our recipe. I can’t recommend this one enough! So good. My Funnel Cakes came out great.. My Family Loved them! I made 2 This Plate size Cakes. I just made the funnel cake, came out very good. I did add 1 teaspoon of vanilla to the batter. Loved it, so did my family. To make it look like the funnel cakes from the fair, I put the batter in a pastry bag and squeezed it out in a circle then swirled it around back and forth so the batter could connect to each other. Plate size funnel cake came out great, with a good crisp to it. YUM. I added the strawberries and powered sugar..WOW!!! This is a keeper. I did try to pour the batter with the measuring cup but it poured out too heavy and wasn’t a steady flow. I was able to make 5 funnel cakes, though it depends on how many times you swirl the batter back and forth. Thank You, This is really good! Okay I love funnel cakes! I get one every time I go to a fair or an amusement park! Thanks for this recipe!